Where have I been you might ask? Nothing exotic, that is, unless you consider Syracuse, New York, exotic! lol We left early Friday morning and headed off to East Syracuse to meet up with Janet from Calico Gals. It was wonderful to connect! We went out for lunch at Joey's Italian Restaurant. The food was yummy! Janet is a wealth of information and kindly shared her business knowledge with me. We did do a mini brainstorming for next years Row-by-Row shop hop! Calico Gals were also hosting a quilt retreat, that we were invited to join. That evening, Gina and I had a wonderful time, meeting new quilters and enjoying some down time. During the retreat, we had the opportunity to join in on various groups projects. This is what we chose to make! Yes, wool! Have I mentioned that I'm hooked on wool? lol Like I need more hand projects! 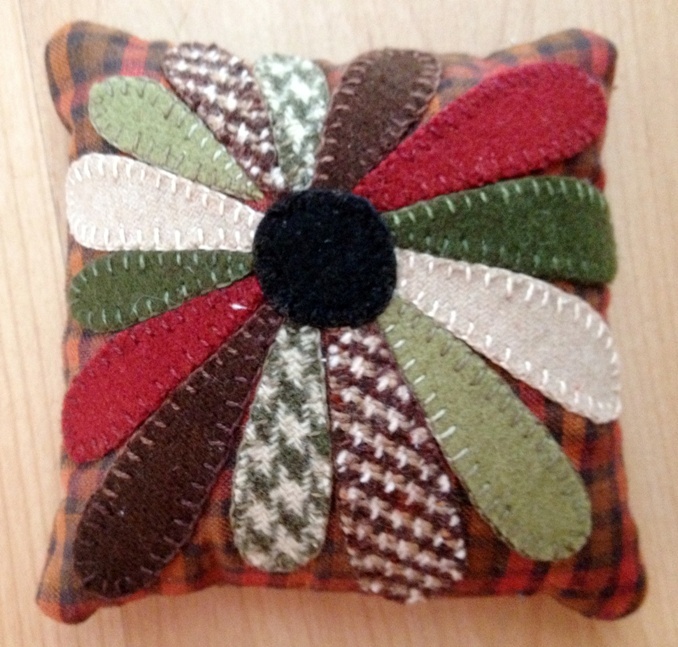 I enjoyed working on this pin cushion while getting to know the various quilters. Thanks for stopping by. More later about the rest of my mini vacation! I'm glad you got a little break fro the shop. It's good to have some down time! What a delightful break it must have been for you. It is always nice to get heads together to talk shop! The pincushion looks great and I am sure it is fun stitching with all the hand stitching you do. Sounds like a fun time and wool is fun to work with. What a great little cushion, love it!